This was the second day of my short quest to finish up the Nifty Ninety, a Bay Area peak list that had been recently released by the SF Sierra Club. My companions on the first day decided they'd had enough of my foolishness (claiming they had more pressing things to do, can you imagine that? ), leaving me to do the last three on my own. My wife still wasn't happy with me for the miscommunication of the previous evening, but we had a nice walk to get coffee in the morning and I did my best to be the attentive husband before running off again for the rest of the day. I didn't leave San Jose until nearly 9a and would have to hustle if I was going to get back in time for dinner. This is a minor rock outcrop along the Ohlone Trail in the Diablo Range between Lake Del Valle and Calaveras Reservoir. I had been up this trail half a dozen times for various peaks in the area, including the competing points for the Alameda County HP, but had never even noticed this feature. 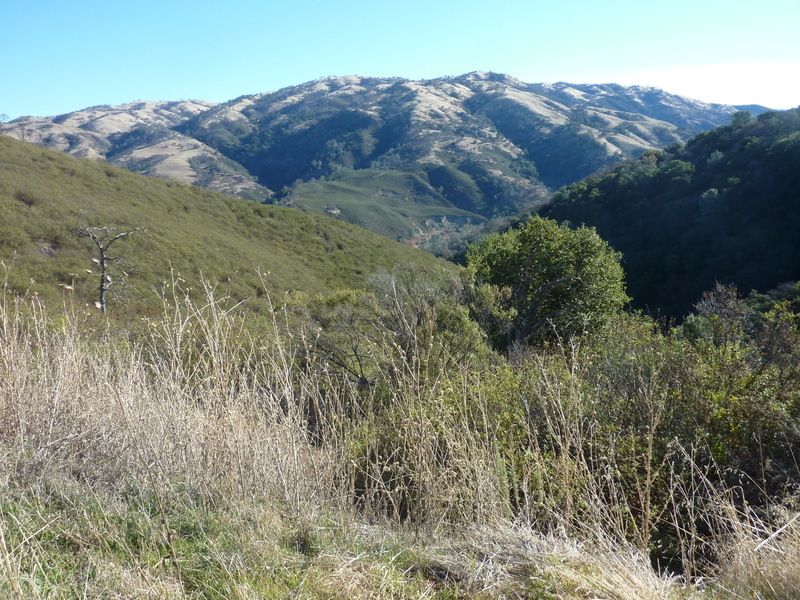 Starting from Lake Del Valle, I hiked the first 4.5mi of the Ohlone Trail up and over Rocky Ridge (stopping at the highpoint there for a bonus peak) before descending to Williams Gulch and a final climb up to Schlieper Rock. There is a memorial plaque located on the north side of the rock, visible from the trail if you happen to glance up. The rock is class 2, with about 20ft of prominence and nice views overlooking the range to the north and east. The plaque commemorates Fred Schlieper, 1890-1953, a silversmith in the area during the 1940s. By jogging most of the downhill sections, I managed the roundtrip effort in just under 3hrs. An hour and a half of driving through moderately heavy traffic got me to Solano County, Interstate 80, and eventually the Hiddenbrooke neighborhood. Sulphur Springs Mtn is the highpoint of this grassy collection of low hills northeast of Vallejo. I used the Ridge Trail, starting from the corner of Hiddenbrooke Pkwy and Bennington Dr, to access the open space area. There is no parking at the poorly-signed TH, but there is some available at a nearby retail space. The trail switchbacks in a delightfully relaxed (or painfully slow, depending on your mood) fashion, up the grassy slopes where cattle graze in an uncaring manner. After the first turn, I simply headed straight uphill, cutting the distance in half though of course the elevation gain (600ft) remained the same. There are some old telecom structures at the summit, the highpoint somewhere along the short ridgetop, half-covered in trees. A pathway leads into the trees where a pair of folding chairs and a small table can be found, perhaps a teenage drinking spot? I took some pictures looking west, east and south before beating a retreat back down. The pony is yours !